If you've been without teeth or suffering from a dental disease for a while, you may have lost too much bone to support dental implants. A denture or partial may be the right solution for you. You may also find that dentures and partials better fit your budget. There's no need to be concerned about the look and feel of your dentures or partial denture from Capital Smiles; we use the latest materials and best dental laboratories to make sure that you're satisfied with the results. “I've worn dentures for 45 years and these are the best I've had. Great care was taken to make them as perfect as possible." Dentures and partials are held in place by suction and the fit to the jawbone. You may find that denture adhesives help a full denture stay in place more securely, while a partial denture will use clasps to hang on to remaining teeth for greater stability. Whatever you do, don't let missing teeth go untreated. If you've lost all the teeth along an arch, you'll want to seek tooth replacement like a full denture as soon as possible. You won't have full oral function or comfort without tooth replacement, and essential activities like eating will be impossible. Even if you've got some remaining healthy teeth, tooth replacement is still essential. 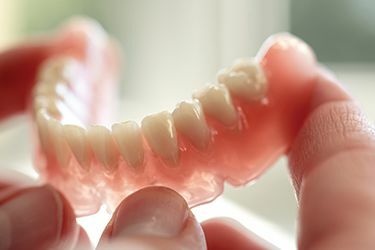 A partial denture can help you maintain a healthy, functional bite, prevent further tooth loss, improve speaking and eating, and offer you better esthetic results. For oral health at every age and stage of life, dentures and partials can play an integral role in keeping your smile in shape. To explore your tooth replacement options at Capital Smiles, contact us for an appointment. We serve Schenectady, Albany, Troy, and the Capital District, providing quality dental treatments and keeping smiles healthy. We want to make sure that every patient that visits our Schenectady dental office gets what their smile needs for optimal comfort, appearance, and function.